Engraving is for us an art, a passion that prods and spurs us to improve more and more our artistic level by means of an unchanging diligence and a continous search for new inspirations. Stimulated by this passion we try to create always new and exclusive hand-engravings. Our little workshop, is able to offer you a complete and high quality hand engraving-work on every kind of metals. We deal mainly in hand engravings on sporting and collection arms, but in the last years we have increased our range od engraved items, ranging from the valuable knives to the wonderful watch (Timepieces). 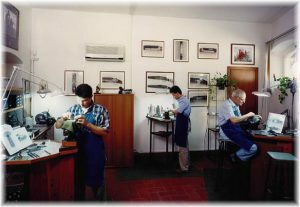 The experience gained since 1986, our Father’s constant and careful conduct allowed us to reach an excellent level in the differently engravings-techniques, such as Bulino, (Burin) Punta Secca (Scrider and small hammer), gold inlay and enamels colors engravings. Contact us and we will be able to lead and to advise you in the designing of an exclusive, original and personalized masterpiece of hand engraving-art.